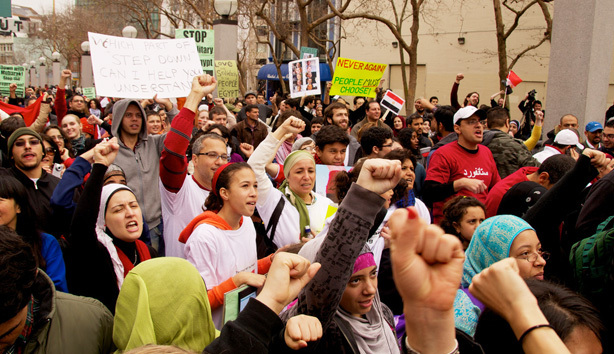 Supporters in San Francisco, California, marched on January 29, 2011, to show solidarity for those calling for democracy in Egypt. Photo by Steve Rhodes. Seattle Pacific University may be 6,843 miles from Cairo, Egypt, but SPU students shortened the distance when they held two forums about the historic political changes rocking the Middle East. By mid-February, two student forums had already provided the SPU community with an opportunity to hear from Egyptian nationals, Middle East experts, and SPU students who had recently studied there. “People in Egypt were rising spontaneously, and two different groups on campus rose up spontaneously to discuss it,” says Associate Professor of English Kimberly Segall, who focuses on international literature and has lived in Iraq. Although the SPRINT trip had been cancelled, students continued asking questions about the unfolding events, the region’s recent history, and how they could pray for the region. In answer, Sallee invited Holsinger to give historical context, and SPU seniors Tyler Anders and Kelsey Hampton, who both studied in Cairo in 2009. “This was a case of a group of students demonstrating how to engage the world and change our culture,” says Holsinger. To give her fellow students an opportunity to understand the events, O’Connor invited Segall and Ruth Ediger, associate professor of political science and geography, to put events in context and counter misconceptions about the Middle East. She also invited Maged Zahir, a Coptic Christian and engineer from Cairo, and Marwa Maziad, a University of Washington graduate student, to give their views on the changes in their homeland. The discussions about the sweeping changes in the Middle East have continued in Segall’s and others’ classrooms, adds Segall. “This enhances cultural engagement, and critical awareness in class is enlarged,” she says. “It’s been very exciting for college students to witness people of their own age taking to the streets,” she says.